I eagerly anticipated the movie Dunkirk. 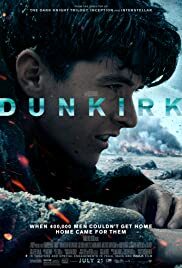 That was a pivotal battle in WWII, and it was directed by one of my favorite directors, Christopher Nolan (I’ll forgive him for Interstellar). So I went to see it on Saturday. There was a confusing element I didn’t sort out until after the movie. It was comprised of 3 inter-related story lines but they didn’t happen simultaneously. They took place over 3 different periods of time but ended at the same time. Does that make sense? He introduced the story lines based on location and then there was a period of time for each. The movie flipped back and forth between the story lines so the events were not portrayed consecutively. As a result the story dealing with the Mole, the name of the “pier” they used on the beach, and the men trying to flee the German armies was compressed and told alongside the expanded story of one of the boats (fishing, commercial & recreational) sent to rescue the soldiers, and a trio of Spitfires that provided support in the Channel during the time just before the boats arrived. So, this interesting way of telling the story was confusing until I figured what was actually going on. “Hey, why is it night time at the Mole but in the middle of the day in the Channel?” As a result, some events are retold from a different perspective (the Spitfires, then the boat and perhaps then the men escaping the Mole). Interesting film making. I was surprised when the setting was described as “The enemy” cornered the “French and English armies” at Dunkirk. Not the German or Axis armies. The enemy, which is quite generic and possible designed to not ruffle any feathers. I don’t recall even seeing a German soldier. The closest was the shots of German planes. You saw the effects of soldiers, gun fire, but they were an invisible enemy. Or nearly so since the focus really wasn’t on them. It was really on the main characters of the story lines. The Mole: You are initially introduced to the main character as his squad is ambushed. All are shot except him, and he gets within the perimeter established by the French forces. He then meets another soldier who is finished burying a soldier after taking his boots, to add some ambiguity to the story. These two men repeatedly try to get off the beach, only to fail with increasing measures of danger. At times they cut to the British Army and Navy commanders who discuss the bigger picture: Churchhill needs an army but can’t risk all the planes and ships due to the seemingly superior German air force and submarines. We see a number of ships get sunk by them. The Sea: A father and his son, aided by a young deck hand, pilot a boat dispatched to rescue soldiers. They don’t wait for the men from the navy to commandeer the vessel but go so they can pilot their own vessel (some of the boats used in the film were part of the actual rescue- this is why you watch the credits). They were not the only civilians to do this. Along the way they encounter sunk ships and rescue men. The focus is on the bravery of ordinary civilians heading into a war zone for love of brother and country. The Air: In the first encounter with the enemy the leader is shot down, and the focus in on a particular pilot, Farrier played by Tom Hardy. We only hear the voice of the other pilot until he is shot down. We see the courage of these pilots who repeatedly risk their lives in dog fights, or in running out of fuel, in order to save boats filled with soldiers. So there is a contrast between the desperate fear of the guys who want to get off the beach (for good reason) and the bravery of those coming to rescue or support them. The same circumstances produced very different responses. This contrast is repeated at the end. The rescued soldiers feel like failures and in some cases cowards. But the crowds welcome them like heroes knowing they still have an island to defend and those men must do it. Their future is bound up in the ability and confidence of these shattered men. They soldiers even misinterpret some of their actions based on their erroneous perception of things. But then there is the media who laud the rescue effort but focus on the immanent threat of invasion such that it all seems like a failure. A great movie has you thinking about it after you’ve left the movie theater. Not thinking about the special effects or a few lines. Thinking about the plot, the story telling, the themes. This movie accomplishes that. I left pondering the courage of ordinary people in the face of the unpredictable horror of war. But it also left me wondering why there was a warning about distracted driving at the end of the credits. This is a movie worth seeing, and on the big screen.